For those who want to see the serious side of Venom, this isn't the movie for you. It’s rare that a villain is iconic and well-known enough to get their own movie, but if there were a shortlist of candidates, Venom would be on it. The titular symbiote has been battling Spider-Man throughout the years and has many different incarnations, so there is plenty of source material to mine. In Venom, Tom Hardy takes on the character of Eddie Brock, an earnest journalist whose pursuit of the truth tends to hurt his professional and personal relationships. After an interview with the Life Foundation’s Carlton Drake (Riz Ahmed from The Sisters Brothers and Rogue One: A Star Wars Story), Brock ends up ruining his career and losing his fiancée, Anne (Manchester By The Sea’s Michelle Williams), in one fell swoop. Eddie is now directionless and struggling to make ends meet, but he still believes Drake is up to no good. As one might expect, Eddie finds out what Drake is up to, but exposes himself to alien goo in the process. This alien goo, a symbiote called Venom, fuses with Brock’s DNA and essentially occupies his body. Venom is the bad cop to Brock’s good cop. He wants to eat human flesh and eliminate anybody that stands in his way, while Brock tries to be the voice of reason. But once Drake tries to reclaim Venom, the symbiote starts to show its true power, which includes transforming Eddie into a massive hulking monster. For casual viewers, the Venom storyline is going to sound ridiculous, and by and large, it is. But give credit to director Ruben Fleischer (Zombieland, Gangster Squad) and the writers for fearlessly leaning into the character. 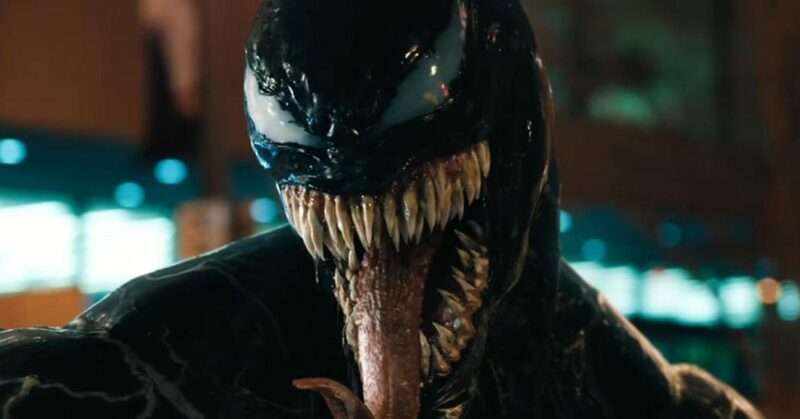 Venom doesn’t pull any punches when it comes to adapting the comic book character, but instead relishes in the fact that a sentient alien substance bites heads off in one moment and bickers with its host the next. There’s something oddly compelling about the Brock/Venom relationship, and Hardy is great as both. However, not all of the film is dedicated to the weird dynamic. The plot is coherent, but it follows a very familiar “bad guy is bad and has an evil plan” formula and the side plots are totally forgettable. Venom is only memorable because Hardy seems to be having so much fun playing off himself, trying to rein in a murderous symbiote that has taken a liking to him. Everything else about the film is atypical of a bad comic book movie: pointless romance subplot, bad guy ends up getting his own bad symbiote, and bad guy’s thugs are determined to stop the good guy despite him possessing superhuman abilities. Venom is, at best, worth a rental, but only for watching Hardy do his thing. If you’re looking for a solid comic book movie or want to see a serious version of Venom, this is not it. The film is at its best when it embraces the comedy, and that is not going to appeal to many people. But, strangely, it might be worth continuing the series to see how far Hardy is willing to go with the Venom character. Venom‘s biggest struggle is its reliance on a fully CGI character. As a result, a lot of the big set pieces don’t look convincing enough and it’s oftentimes hard to follow the action. Watching two CGI monsters do battle is a difficult sell on its own, and Venom struggles to make things exciting. It gets a little better when the fighting involves real life humans or during a motorcycle chase, but it’s still too numbing to generate the necessary excitement. As mentioned, Venom works best because of the relationship between Eddie Brock and Venom the Symbiote, not because it impresses with effects or choreographed action.